I have had two recipes/ideas I've been wanting to try for-ev-er, and the chance finally came. I have seen a few blogs with Pink Lemonade Cupcakes that I've been wanting to make probably since not too long after getting married (3 years ago). Some have been made with a cake mix and some from scratch. I have zero aversion to box mixes, especially considering I always have 2-3 in my pantry of basic flavors just in case, however I wanted to make these from scratch so that I could control how many I made as I didn't need 24-30 like I normally get from a box. Additionally, I've been wanting to decorate cupcakes with butterflies, ala "Hello, Cupcake!". 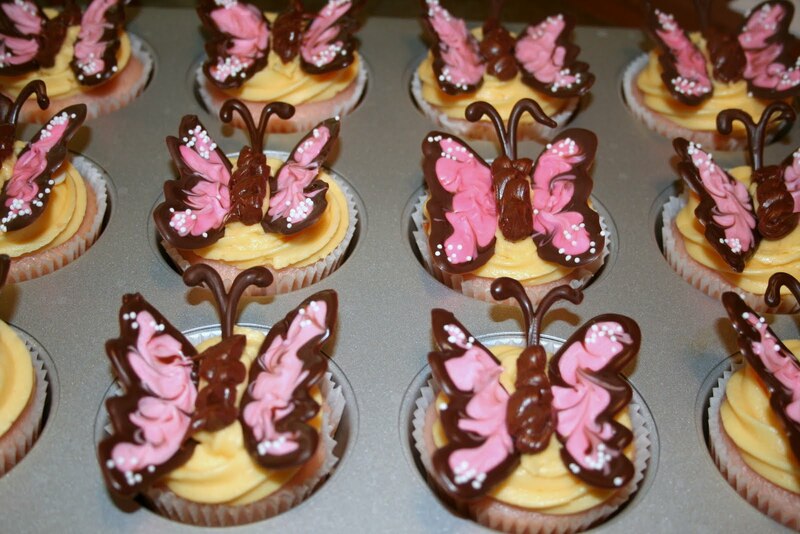 I thought these butterflies would be adorable on Pink Lemonade cupcakes - perfect for spring/summer time. I don't have the "Hello, Cupcake!" book, however Annie over at Annie's Eats has a great tutorial on how to make these cuties yourself. These cupcakes were a hit. The flavor was great - sweet, but lemony, and not over powering. 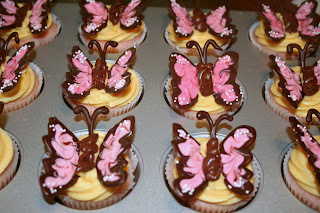 Plus who wouldn't love the butterflies!? Directions: Preheat oven to 350F. Line muffin pan with liners. In a small bowl, combine flour, baking powder, baking soda and salt. Set aside. In a large bowl, whisk together sugar, oil, egg whites and lemonade concentrate. Alternately whisk in flour mixture and buttermilk, making three additions of flour mixture and two of buttermilk, beating until just smooth. Add just enough food coloring to turn the batter a light shade of pink. Scoop batter into liners (fill about three-fourths full). Bake in preheated oven for 20-25 minutes or until tops of cupcakes spring back when lightly touched. Let cool in pan on rack for 10 minutes. Remove from pan and let cool completely on rack. Top cooled cupcakes with frosting (see below). Add the butter, confectioner’s sugar, salt, lemonade concentrate, and a few drops of food coloring to the stand mixer and mix on low using the paddle attachment until combined. Turn the speed to med-high until the buttercream is fluffy and uniformly yellow. Pipe or spread onto cooled cupcakes. 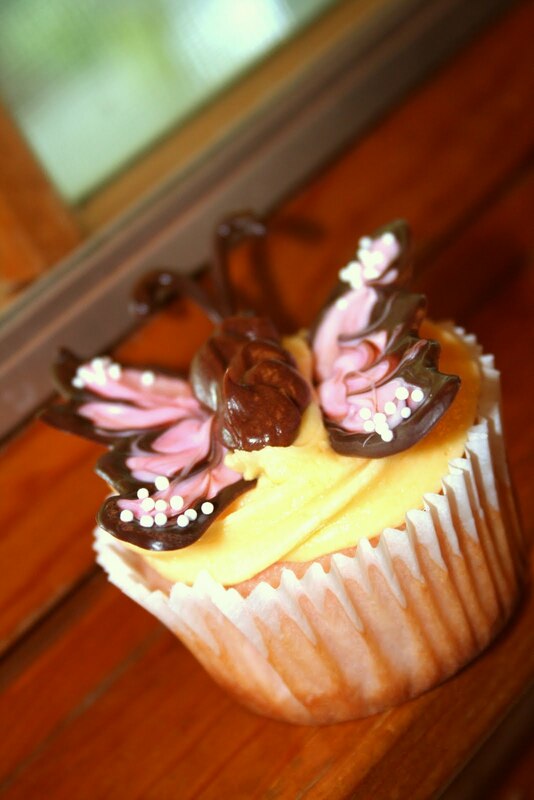 Butterflies from Annie's Eats and Hello, Cupcake!